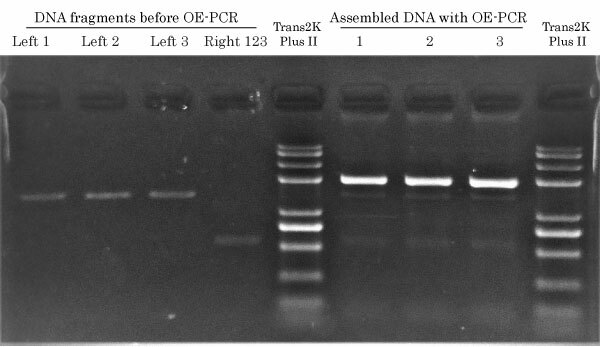 PCR Protocol for DNA assembly by PCR extension of overlapping DNA fragments. The overlap extension polymerase chain reaction (or OE-PCR) is a variant of PCR. 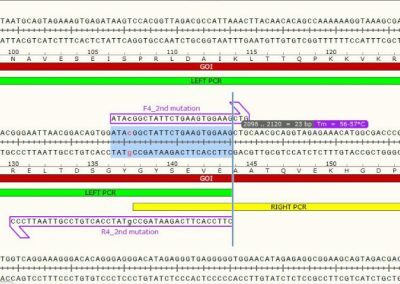 It is also referred to as Splicing by overlap extension / Splicing by overhang extension (SOE) PCR. It is used to insert specific mutations at specific points in a sequence or to splice smaller DNA fragments into a larger polynucleotide. Why perform Overlap Extension PCR? 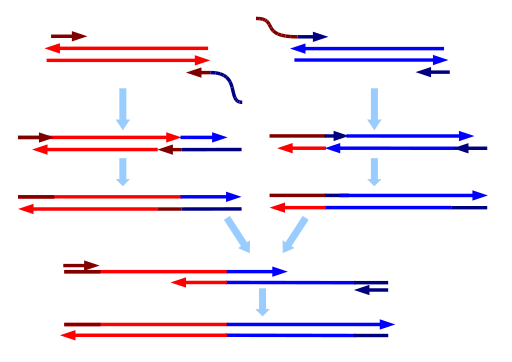 Cloning : a complete gene cannot be amplified from cDNA because specific sequence segments are too different in composition (i.e GC content) and are very difficult to amplify when the amount of target DNA is very low. 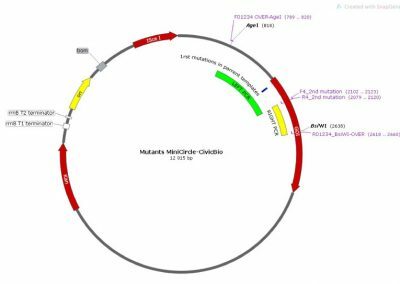 Site-Directed Mutagenesis : performing DNA mutagenesis using a 2-sided PCR overlap extension followed by ligation or seamless assembly into a linerized vector. Multiple gene fusions, cassette or plasmid engineering : things can become quite complex when we engineer custom clones for our customers. Assembling 9 DNA fragments together by seamless assembly (i.e Gibson assembly) won’t work efficiently. 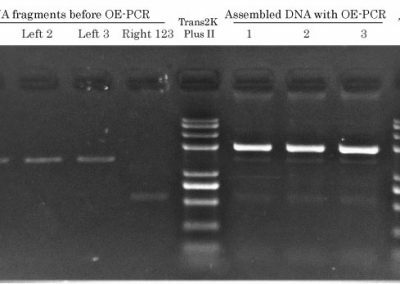 But, if assembly by OE-PCR is used to put together fragments in groups of 3, then seamless DNA assembly using pEASY-Uni will become easy enough to get our clones rapidly. We use the Fast & Steep PCR protocol to accomplish this. 15-45 min for 300 bp and 10 kb respectively. PCR cycling time varies depending on template lenght and ramping rates. Incorporates up to 100% of primers in a very small amount of PCR cycles. GC content and primer specificity may affect the efficiency. 5 to 10 PCR cycles is sufficient. Limit the chance of introducing errors by limiting the amount of doublings and heating cycles, without compromising the DNA yield. ⇒ Depurination involves the loss of purine bases forming abasic sites. ⇒ Depurination decreases at higher pH. ⇒ Depurination is independent of DNA sequence. ⇒ Heating DNA for 10 minutes at 100°C with pH 7.0 leads to about 1 apurinic site per 1000 base pairs. ⇒ Cytosine can be spontaneously deaminated to form uracil. ⇒ Cytosine in native DNA is estimated to deanimate with a rate constant of 10-10/sec at 70°C. 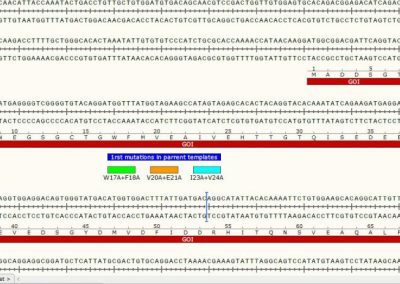 DNA sequence segment showing the location of 3 individual mutations present in 3 individual Minicircles. 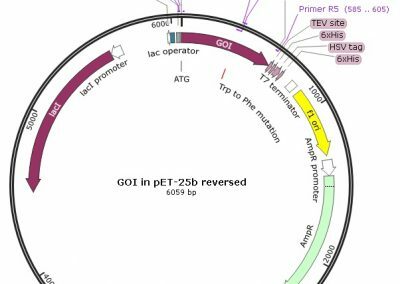 Only 1 mutation is present in each three different parental plasmid templates. All three are depicted here on the same DNA sequence for simplicity. 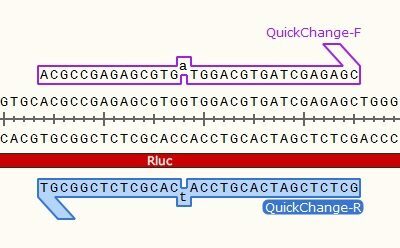 Map of the minicircle templates used for overlap extension PCR. 3 individual minicircles are used as template for PCR for combining the 1rst mutation (either 3 of them) with a 2nd mutation. The region amplified by the LEFT PCRs (for Left 1, 2 and 3) is shown in green. 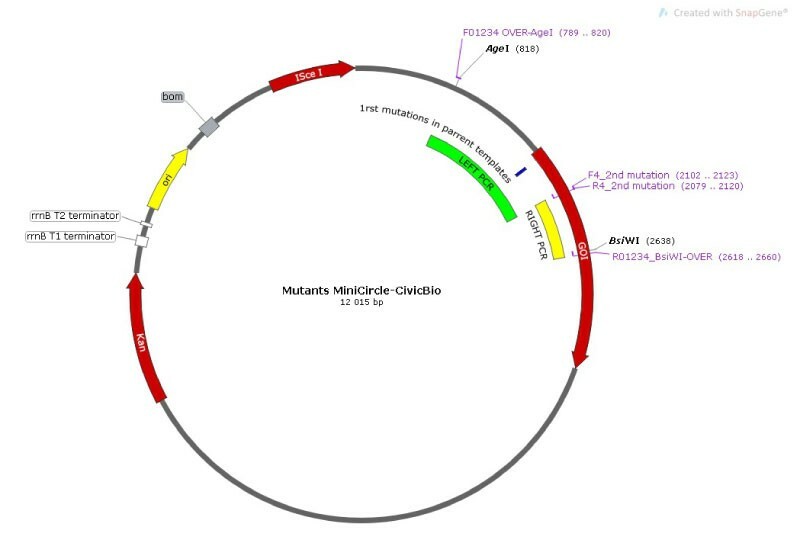 The common RIGHT PCR region used to add the 2nd mutation is shown in yellow. 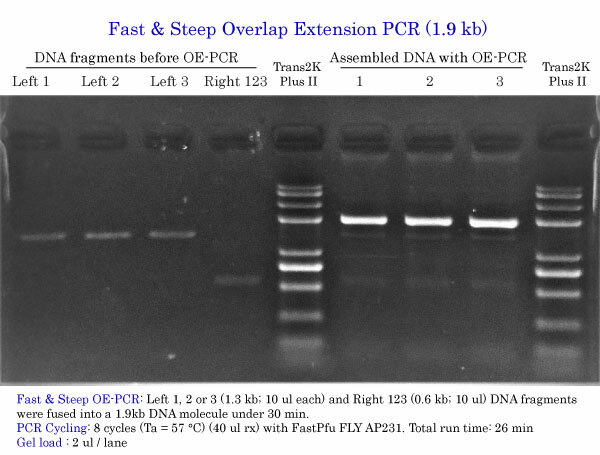 The 3 LEFT PCRs and the RIGHT PCR were amplified using Fast & Steep PCR. 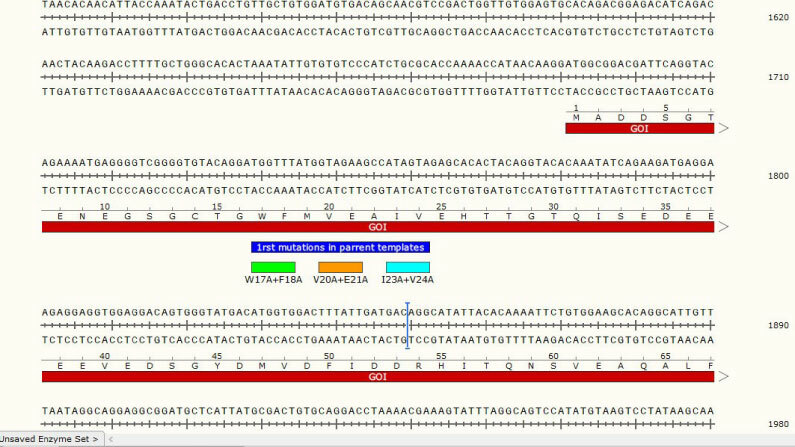 Left 1, 2 or 3 (1.3 kb) fragments, each amplified from their respective parent template containing only either one of the three mutations, and thee Right 123 (0.6 kb) DNA fragment, used to add a second and common mutation to any of the 1rst mutations, were amplified by Fast & Steep PCR. 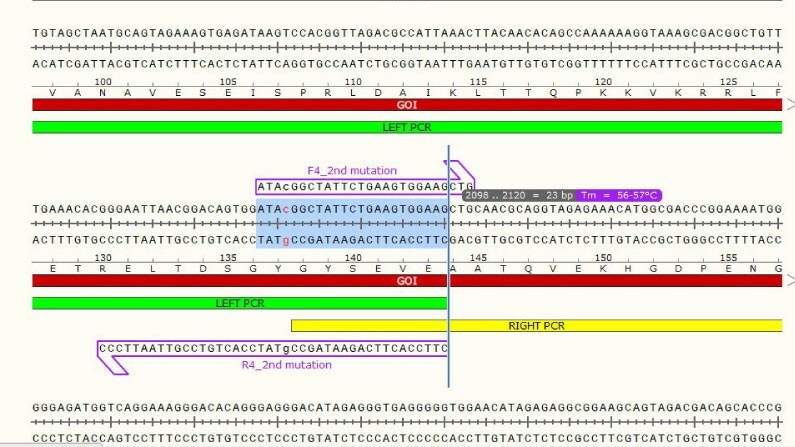 LEFT and RIGHT PCR fragments overlap each other by 23 bp. 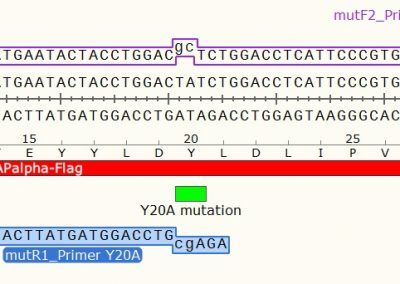 The overlapping region contains the second desired mutation in order to generate double mutants. The 23 bp overlap has an expected Tm of 57 °C. It’s important to design overlapping DNA segments having a Tm equal or greater than the Tm of external primers used for the OE-PCR reaction. Left 1, 2 or 3 (1.3 kb; 10 ul each) and Right 123 (0.6 kb; 10 ul) DNA fragments were fused into a 1.9kb DNA molecule under 30 min using Fast & Steep PCR.